Incan architecture is the most significant pre-Columbian architecture in South America. The Incas inherited an architectural legacy from Tiwanaku, founded in the 2nd century BCE in present-day Bolivia. The capital of the Inca empire, Cusco, still contains many fine examples of Inca architecture, although many walls of Inca masonry have been incorporated into Spanish Colonial structures. 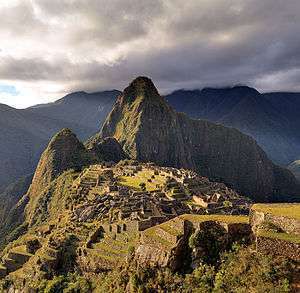 The famous royal estate of Machu Picchu (Machu Pikchu) is a surviving example of Inca architecture. Other significant sites include Saksaywaman and Ollantaytambo. The Incas also developed an extensive road system spanning most of the western length of the continent. Inca buildings were made out of fieldstones or semi-worked stone blocks and dirt set in mortar; adobe walls were also quite common, usually laid over stone foundations. The material used in Inca buildings depended on the region, for instance, in the coast they used large rectangular adobe blocks while in the Andes they used local stones. The most common shape in Inca architecture was the rectangular building without any internal walls and roofed with wooden beams and thatch. There were several variations of this basic design, including gabled roofs, rooms with one or two of the long sides opened and rooms that shared a long wall. Rectangular buildings were used for quite different functions in almost all Inca buildings, from humble houses to palaces and temples. Even so, there are some examples of curved walls on Inca buildings, mostly in regions outside the central area of the empire. Two-story buildings were infrequent; when they were built the second floor was accessed from the outside via a stairway or high terrain rather than from the first floor. Wall apertures, including doors, niches and windows, usually had a trapezoidal shape; they could be fitted with double or triple jambs as a form of ornamentation. Other kinds of decoration were scarce; some walls were painted or adorned with metal plaques, in rare cases walls were sculpted with small animals or geometric patterns. The most common composite form in Inca architecture was the kancha, a rectangular enclosure housing three or more rectangular buildings placed symmetrically around a central courtyard. Kancha units served widely different purposes as they formed the basis of simple dwellings as well as of temples and palaces; furthermore, several kancha could be grouped together to form blocks in Inca settlements. A testimony of the importance of these compounds in Inca architecture is that the central part of the Inca capital of Cusco consisted of large kancha, including Qurikancha and the Inca palaces. The best preserved examples of kancha are found at Ollantaytambo, an Inca settlement located along the Urubamba River. The first two types were used on important buildings or perimeter walls while the last two were employed mostly on terrace walls and river canalization. According to Graziano Gasparini and Luise Margolies, Inca stonemasonry was inspired by the architecture of Tiwanaku, an archaeological site in modern Bolivia built several centuries before the Inca Empire. They argue that according to ethnohistorical accounts the Incas were impressed by these monuments and employed large numbers of stoneworkers from nearby regions in the construction of their own buildings. In addition to these references, they also identified some formal similarities between Tiwanaku and Inca architecture including the use of cut and polished stone blocks, as well as of double jambs. A problem with this hypothesis is the question of how was expertise preserved in the three hundred years between the collapse of Tiwanaku and the appearance of the Inca Empire and its architecture. As a solution, John Hyslop has argued that the Tiahuanaco stonemasonry tradition was preserved in the Lake Titicaca region in sites such as Tanka Tanka, which features walls resembling Inca polygonal masonry. A second major influence on Inca architecture came from the Wari culture, a civilization contemporary to Tiwanaku. According to Ann Kendall, the Huari introduced their tradition of building rectangular enclosures in the Cusco region, which formed a model for the development of the Inca kancha. There is evidence that such traditions were preserved in the Cusco region after the decline of the Wari as is attested by the enclosures found at sites such as Choquequirao (Chuqi K'iraw), 28 kilometers southeast of the Inca capital. Usually the walls of Incan buildings were slightly inclined inside and the corners were rounded. This, in combination with masonry thoroughness, led Incan buildings to have a peerless seismic resistance thanks to high static and dynamic steadiness, absence of resonant frequencies and stress concentration points. During an earthquake with a small or moderate magnitude, masonry was stable, and during a strong earthquake stone blocks were “ dancing ” near their normal positions and lay down exactly in right order after an earthquake. Another building method was called "pillow-faced" architecture. Pillow faced building was achieved by using fired adobe bricks, and mud mortar. The Incas would then sand large, finely shaped stones coated in mud and clay. Then they would fit the bricks and stones together using the mud mortar into jigsaw like patterns. Pillow-faced architecture was typically used for temples and royal places like Machu Picchu. 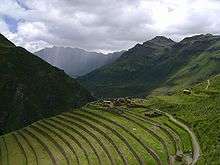 Perhaps the most renowned aspect of Incan architecture is the use of terraces to increase the land available for farming. These steps provided flat ground surface for food production while protecting their city centers against erosion and landslides common in the Andes. The masons at Machu Picchu built these so well that they were still intact in 1632 when Hiram Bingham re-discovered the site. The Incas had an extensive road system. A high road crossed the higher regions of the Cordillera from north to south and another lower north-south road crossed the coastal plains. Shorter crossroads linked the two main highways together in several places. The terrain, according to Cieza de Leon, an early chronicler of Inca culture, was formidable. The road system ran through deep valleys and over mountains, through piles of snow, quagmires, living rock, along turbulent rivers; in some places it ran smooth and paved, carefully laid out; in others over sierras, cut through the rock, with walls skirting the rivers, and steps and rests through the snow; everywhere it was clean swept and kept free of rubbish, with lodgings, storehouses, temples to the sun, and posts along the way. To help travelers on their way, rest houses or tambos were built, here they could spend a night, cook a meal and feed their llamas. 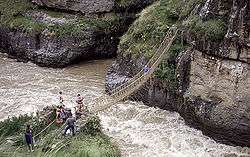 The Incas built suspension rope bridges using grass. These bridges which were made from ropes ingeniously tied together formed a narrow but effective structure. This was the only way to cross rivers on foot. If only one of their hundreds of bridges was damaged, a major road could not fully function. Fortunately, every time a bridge broke, the locals would repair it as quickly as possible. ↑ Hyslop, Inka settlement, pp. 11–12. ↑ Hyslop, Inka settlement, pp. 5–6. ↑ Hyslop, inca settlement, p. 6. ↑ Gasparini and Margolies, Inca architecture, p. 134. ↑ Hyslop, Inka settlement,pp. 7–8. ↑ Hyslop, Inka settlement, p. 8. ↑ Hyslop, Inka settlement, pp. 9–10. ↑ Hyslop, Inka settlement, pp. 10–11. ↑ Hyslop, Inka settlement, pp. 16–17. ↑ Hyslop, Inka settlement, p. 17. ↑ Gasparini and Margolies, Inca architecture, pp. 181, 185. ↑ Gasparini and Margolies, Inca architecture, p. 187. ↑ Hyslop, Inka settlement, p. 12. ↑ Protzen, Inca architecture, p. 211. ↑ Rowe, An introduction, pp. 24–26. ↑ Agurto, Estudios acerca, pp. 144–175. ↑ Hyslop, Inka settlement, p. 15. ↑ Gasparini and Margolies, Inca architecture, p. 25. ↑ Gasparini and Margolies, Inca architecture, pp. 78. ↑ Gasparini and Margolies, Inca architecture, pp. 12–13. ↑ Hyslop, Inka settlement, p. 23. ↑ Kendall, Aspects of Inca architecture, p. 352. ↑ Hyslop, Inka settlement, p. 20. (Spanish) Agurto, Santiago. Estudios acerca de la construcción, arquitectura y planeamiento incas. Lima: Cámara Peruana de la Construcción, 1987. Kendall, Ann. Aspects of inca architecture: description, function and chronology. Oxford: British Archaeological Reports, 1985. Protzen, Jean-Pierre. Inca architecture and construction at Ollantaytambo. New York: Oxford University Press, 1993. Rowe, John. An introduction to the archaeology of Cuzco. Cambridge: Harvard University, 1944.